Weekend Read: Leak: Nokia Phi, Nokia Dogphone, Lumia 908, Juggernaut Alpha? We haven’t covered these new fangled Nokia names before but we thought you might as well hear about them in case you’ve missed it. These have appeared in a few benchmark apps and now on occasional gamer where a phone’s identity appears in their stats. 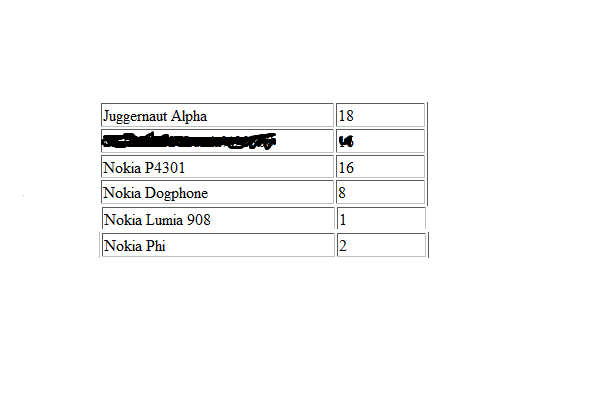 >>The Juggernaut Alpha, second time this device is spotted randomly, first it was in the benchmarks of WPBench.On this occasion it got spotted on Occasional Gamer’s stats.Their is no confirmation that this device is from Nokia. >>Nokia Dogphone, again this device was in the stats of occasional gamer and it was tested eight times.Name “Dogphone” does not make any sense in what kind of the device is tested whether commercial or developer. Nokia Lumia 908, there is no previous background rumor details about this device except in the occasional gamer’s stats.Looks like this device is in initial phase of the testing as count is only ‘1’ in the stats. Nokia Phi, It’s second time this device’s reference has emerged previouly in benchmarks test of WPBench. Definitely there would be some questions about ‘Nokia P4301’, the model number doesn’t indicates that this one is really a Nokia it seems to be a LG device named wrongly, for ex: other phones are also there in stats which are named wrongly like ‘NOKIA LG E-900’.“So no confusion, great combination”. cheers everyone for the tip. An engineering student, java programmer, little hardware and software hacking, and a Nokia freak. Contact: http://facebook.com/prashantanduk , http://facebook.com/officialn9 twitter: @Techgeass feel free to contact.